Boss Resources could be well placed to meet the needs of a burgeoning uranium bull market after reporting a 30 per cent mineral resource increase at the Honeymoon mine restart area in South Australia. BHP is trialling zero-emissions vehicles at the Olympic Dam operation in South Australia in an attempt to reduce exposure to particulate matter. BHP has launched the operation of an underground ramp that will improve access to higher-grade copper at the Olympic Dam mine in South Australia. Junior miners Cohiba Minerals and Auroch Minerals have talked up the potential of their projects in the wake of BHP’s revelation of a discovery near Olympic Dam in South Australia. BHP has identified iron oxide, copper, gold mineralised system near Australia’s largest reserve of copper and uranium ore, the Olympic Dam operations in South Australia. BHP chief executive officer Andrew Mackenzie says the company will continue to invest in its rail structure in light of Monday’s derailment of a BHP iron ore train in the Pilbara, Western Australia. BHP chief executive Andrew Mackenzie has claimed that businesses are navigating “global volatility” in a thinly veiled reference to escalating trade tensions between the United States and China. BHP is trialing drones to inspect its ocean freight operations, building on the successful integration of the technology at mine sites. BHP is reportedly working to fix a technical issue that has disrupted its processing facilities at the Olympic Dam mine in South Australia. Minetec has been awarded a contract to supply BHP’s Olympic Dam mine in South Australia with an underground fleet management system. Mining Education Australia (MEA) is an important part of the modern fabric of Australia’s tertiary mining education, supporting around 80–85 per cent of the current crop of mining graduates. 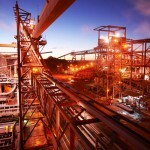 BHP’s ramp-up of operations at Olympic Dam following a maintenance program has been slower than expected, forcing the miner to lower its copper production guidance at the South Australian mine. BHP is continuing a recruitment drive for the Olympic Dam mine in South Australia as it ramps up operations to full capacity in the current quarter.